Notes: My English vocabulary is leaving me! I know what I mean by “patterning”, but I’m quite certain there’s got to be a better word for it. Patternwork? Dang, that’s not a word. Detail? Eh. I got nothing. I thought this was pretty cool. 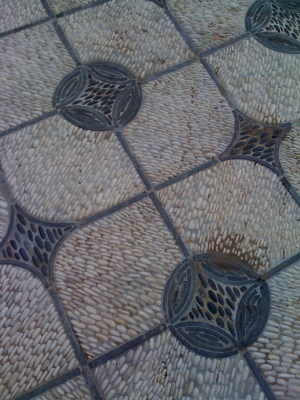 Not only is it, essentially, a cobblestone floor, but the stones are used to create patterns that look like tile! How cool is that?! Check it out: All the lines in there and everything are just stones. Wild! The crew of the Ivoire is just realizing that they’re in the right place, but the wrong time. What can we deduce about the pronunciation “errors” that renamed Venice City? “Vaycehn” has the same consonants as “Venice” – if we assume that the “c” is pronounced “s” before “e”, the way most readers will say it – but those consonants are re-ordered. VNS has become VSN. This reordering is called metathesis, and it’s seen in many languages, including English. The Old English word “brid” became our modern “bird”, and OE þrītiġ became modern “thirty”. It’s not just a random slinging around of consonants – like other types of sound change, it only occurs in a particular context of surrounding sounds. So in the English words and others like them, a consonant + r + vowel sequence was re-ordered to consonant + vowel + r.
With only one example we can’t guess at what triggered metathesis in “Venice” -> “Vaycehn”, but we can confidently say there was metathesis. Moving on to the vowels, “ay” is probably pronounced as in “way”, and “eh” as in the interjection “eh” or “meh”. While we could postulate even more metathesis here (maybe that “eh” vowel moved from the first syllable to the last, and then the other vowel moved and changed? ), that’s not nearly as clear-cut as the consonant re-ordering – especially since we could also say that each vowel has simply undergone one change in the way it’s produced. What has to happen to change the “eh” in the first syllable of “Venice” to “ay”? A linguist would say that “eh” and “ay” are both mid vowels (which describes the height of the tongue, as we discussed previously,) both front vowels (which describes where the airflow is constricted), and both unrounded vowels (meaning the lips aren’t rounded the way they are in English “you” or “know”). The difference is that “ay” is a tense vowel, and “eh” is a lax vowel. We know that not all lax vowels became tense, because our second vowel in “Vaycehn” is still lax. The short “i” of “Venice” (probably originally a barred i, but let’s not worry about that) has become “eh”. Both vowels are lax, and they’re both pronounced with the tongue raised at the front of the mouth. The difference is how high the tongue is raised. Short “i” is a high vowel, and “eh” is a mid vowel – the tongue isn’t raised as far. So three plausible changes – metathesis, a change in tenseness, and a change in height – turn “Venice” into “Vaycehn”. But a linguist wouldn’t agree with Perkins that the language has been mangled – that an accumulation of errors have twisted it out of its true shape. Did you say “ADD-dress” or “uh-DRESS”? Is that how you always say it? Are you sure? English has a group of word pairs – REB-el and re-BELL, REC-ord and re-CORD, CON-vict and con-VICT – where the word with the stress on the first syllable is the noun, and the word with the stress on the second syllable is the verb. Since the early sixteenth century, a number of words have changed their stress to match this pattern. As Jean Aitchison says in Language Change: Progress or Decay?, “There were 24 [of these pairs] by 1660, 35 by 1700, 70 by 1800, and 150 by 1934.” The noun “address” is currently in flux – some speakers say it one way, some speakers say it another. And they don’t typically consider either way to be wrong. Languages always have some variability of this kind. Languages change when one variant edges out another – and it’s not always perceptible to speakers until it’s pointed out. When Aitchison asks “Progress or decay?”, it’s a trick question. Languages aren’t divided into good and decayed, bad groups. Language change isn’t a bad thing – or a good thing; it’s a neutral process. After all, you aren’t speaking a mangled version of Old English, are you? Posted in grammar, podcast | Comments Off on Conlangery #01: Why Conlang? Tomás insults George’s Spanish, then we get into a discussion about why we conlang and just how personal the hobby is. Then, we talk a little about measure words and genders, and about our Conlang of the Week: Feayran — The language of a race of shapeshifters created by David Edwards. Here is a three word sentence that is going to require two posts. My Miresua conlang word starts with T, the letter in common between the Basque and the Finnish words. A havava ei i foye. Notes: Fresh papaya gets a bad wrap, in my opinion. I think it tastes quite nice. I definitely like what it adds to juices (who doesn’t? ), but the fruit itself is a nice treat. I don’t love it, but I well enjoy it from time to time. Thus concludes my meditation on papaya. The Shmand-Fair started inside a town [...] Looking down, we could see a track made of two parallel straight lines, gleaming in the sunshine, which ran from the town and disappeared in the far distance. Perhaps it’s different for British kids. The opening pages of The White Mountains mention the towns of Winchester and Alton, and characters are named Molly and Henry, so maybe young British readers see the disturbing elements – the upcoming Capping, the modern watches built by ancient craftsmen with long-forgotten skills – rising up from their own backyards. But for an American kid, handed the book by a friendly librarian, the story might as well take place in the generic English-speaking world shared by most kids’ stories. There’s a Winchester, Indiana, and an Alton, Indiana, but SF adventure books were never set in Indiana – it was against the rules. Fleeing Winchester and the Capping, the protagonists cross a smallish body of water and find themselves in a country where they don’t speak the language. Nothing surprising there, to an American reader – the story world can contain anything that might present an exciting challenge. I suspect the White Mountains are the Alps, but there aren’t further linguistic clues – just geographical clues (a six-mile railroad tunnel through solid rock) which I will leave to others. À bas les Tripodes! arnac (noun): alert, careful, thorough. You are currently browsing the Conlangers blog archives for May, 2011.